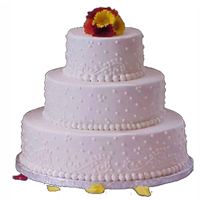 Three Tier Wedding Cake - 7 Lbs. Mesmerize your loved ones in a unique way by sending our Scrumptious Three Tier Cake. The Cake is hand delivered to ensure freshness.